The latest edition of ITU’s annual global ICT regulatory report, Trends in Telecommunication Reform 2016, charts and analyzes the challenges and opportunities facing today’s ICT regulators as services proliferate, platforms converge and network operators ready their infrastructure for the next round of data-intensive technologies, from 5G mobile to the Internet of Things (IoT). As the world’s most comprehensive overview of ICT policy and regulatory trends, ITU’s Trends in Telecommunication Reform 2016 brings together insights from a broad range of leading global experts to help regulators, ICT analysts and tech journalists gain a deeper understanding of the issues facing an increasingly broad array of ICT players – and consumers. New ICT goods and services are bringing with them enormous social and economic disruption. But while there are many benefits to be reaped, the report highlights regulatory challenges that must be addressed to preserve the ‘level playing field’ considered essential to competition and innovation. 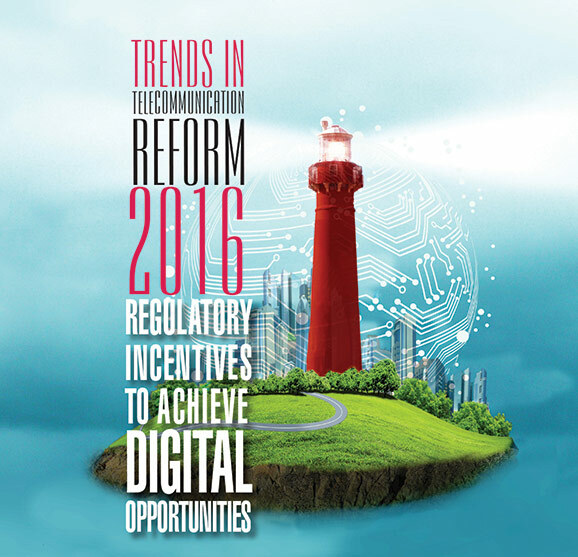 With the theme of ‘exploring regulatory incentives to achieve digital opportunities’, the report emphasizes the growing importance of flexible, light-touch, technology-neutral regulatory principles which stimulate market growth while protecting the rights of consumers and encouraging new entrants. Capital expenditures on fibre infrastructure are expected to surpass USD 144.2 billion between 2014 - 2019. More than 40 operators have launched or are planning LTE-A deployments worldwide; 88% of these operators are in developed markets. The rise in consumer data consumption may spur more Wi-Fi investment. Increasing numbers of existing operators, new entrants and financiers are developing alternative funding approaches for broadband network investments. Investment in broadband infrastructure is also coming from more unlikely institutions such as hedge funds or corporates that do not traditionally invest in telecoms infrastructure. When network coverage becomes less of a competitive differentiator, operators may need to consolidate networks (through network sharing) as a means of moving away from infrastructure investment and towards developing innovative services. Governments currently allocate spectrum mainly on a dedicated basis. New dynamic spectrum access (DSA) technologies allow devices to use spectrum where it is not being used in a particular geographic area, or at a particular time. Network sharing can have many benefits but is not without risks, which can include: reduction in competitive intensity; potential for collusive dealing and information sharing; and reduced options for services-based competitors. The mobile industry association GSMA predicts between 1 - 2 billion M2M connections by 2020. Some experts believe that the market for IoT devices will grow exponentially, resulting in over USD 1.7 trillion in value added to the global economy by 2019. The simplest IoT technology -- passive RFID tagging -- is already widespread in retail, transit ticketing and access control. Near-Field Communication (NFC) is now included in newer smart phones, enabling applications such as contactless payments. More complex M2M systems can send information over cellular networks. Examples include electricity metre readings sent to energy companies and car airbag deployment notifications sent to emergency services. Literally hundreds of millions of M2M systems are being deployed around the world. IoT technical standards have evolved from a variety of different applications and stakeholders with different aims and requirements, and more work is needed to integrate different standards frameworks. A uniform network of “things” is unlikely to develop in the medium term. Smart meters are unlikely to communicate directly with heart-rate monitors, or recipe planners. Some networks will use public infrastructure, others will be entirely private. Some applications will have high bandwidth and interactivity requirements (such as video surveillance), others may focus on transferring short bursts of information (such as smart meters). For IoT to become a truly ubiquitous technology, the cost of tags, sensors and communication systems need to fall to a level where they are a very small fraction of the total costs of the objects to which they are attached, with readers also made easily available. Even the cheapest (printed) tags, known as Quick Response (QR) codes, have not yet generated high responses in consumer-targeted marketing campaigns. A further privacy issue relates to the amount of personal information that can be derived from seemingly innocuous sensor data, especially when it is combined with user profiles and data from other sources. The concept of ‘interoperability’ is much broader than just technical compatibility, with implications across all four key levels – technological, data, human and institutional. making it easier for humans to leverage the interconnections. Interop can also increase opportunities to exploit the system. A system that has more points of access allows (1) more types of systems to connect, (2) processes data with fewer limitations (3) increases potential attack vectors and (4) creates more opportunities for nefarious actors to exploit data or to inject bad code. Increased levels of interoperability tend to enhance user choice and autonomy. Interoperability is not an end in itself, and doesn’t always have to be maximized. Instead, private actors and regulators must work carefully to optimize the level of interop necessary to meet their objectives. Threats to business models – as higher levels of interop are distributed unequally across a market. Some businesses may have a vested interest in maintaining lower levels of interop, allowing them to benefit from customer lock-in.